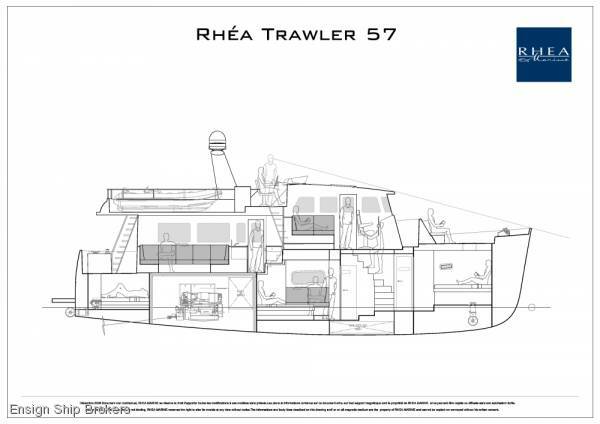 Following the success of the Rhea Trawler 43 and following the demand from owners for a bigger trawler, the yard released three new models to offer more of the well-renowned Rhea quality! As such, tThe Rhea trawler 57 was born. 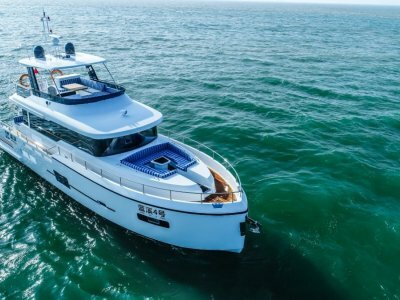 With an overall length 17.40 metres and 3 passenger cabins + 1 crew cabin, this new Trawler 57 allows you to sail around the world in a safety way. 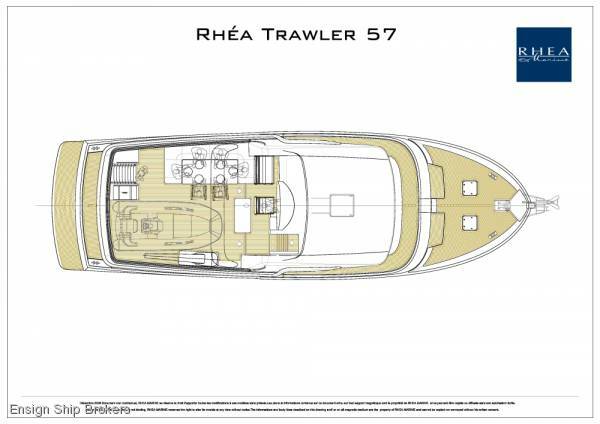 This new RHEA Trawler can be recognised by its trawler’s bow, frigate’s stern and two-tone gelcoat hull, characteristics of the RHEA marine yard. 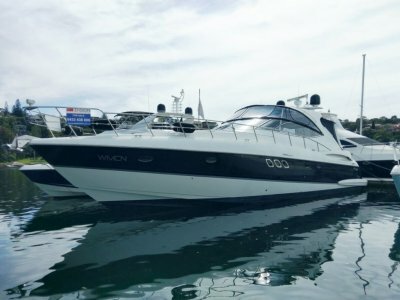 This new boat can also be identified by its Portuguese bridge, its immense wheelhouse fit for a yacht, and its flybridge. 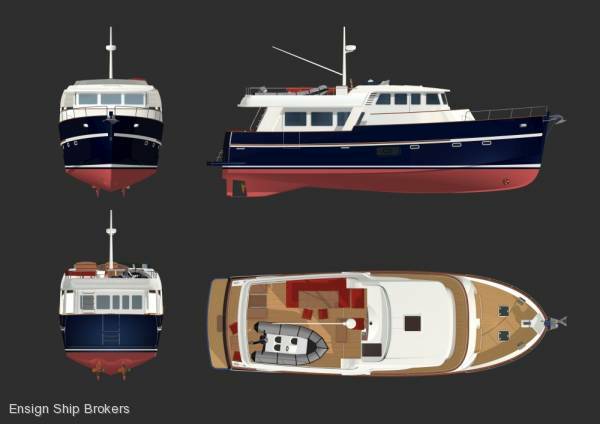 Cruising enthusiasts will appreciate the construction quality, the high-spec equipment, the teak-covered bridge, the protected propellers to prevent damage when running aground, and the semi-displacement hull that provides a range of over 1,000 miles. SALOON: Woodworking teak or others wood and paint. Aft 2 sliding door window with curtains sliding, opening side windows with blinds, U shaped bench seat with cushions and backrests, storage under bench seats, varnished wood saloon table, 2 removable armchairs, bar unit with storage and space provided for an encased TV (optional extra). Storage cupboard with drawer and cubbyholes, handrail on ceiling. 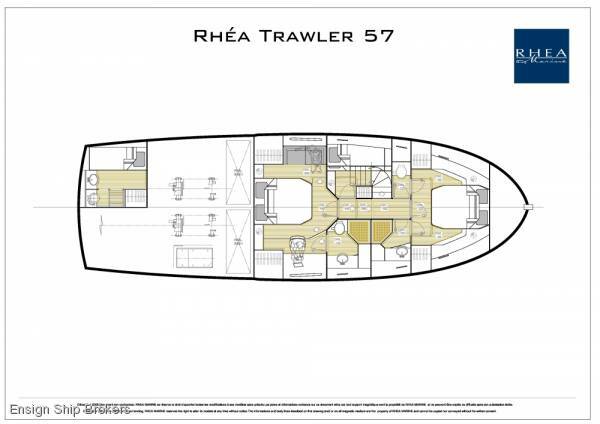 Wheelhouse - Steering station, 2 sliding doors for access to Portugese deck. 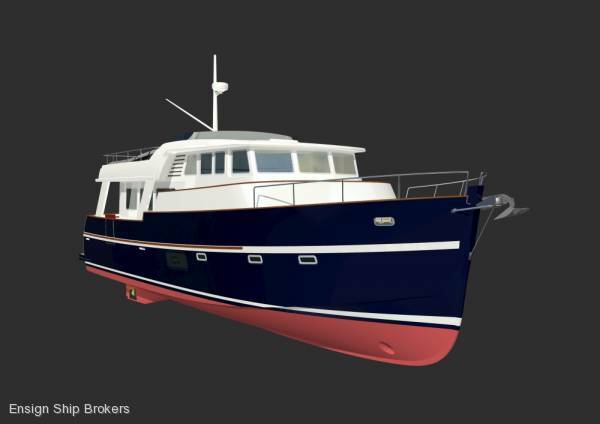 Safety-glass windscreen with demister system, stainless steel windscreen wipers with washer, safety-glass windows around the wheelhouse. Opening hatch in wheelhouse ceiling, adjustable pilot armchair with retractable footrest, hydraulic assisted steering wheel. Steering console, space for navigation electronics and engine instruments, fuel gauges, tiller angle indicator, engine control levers, steering compass. Functional controls: wiper, demister, foghorn, navigation lights, anchoring, thrusters, windlass. 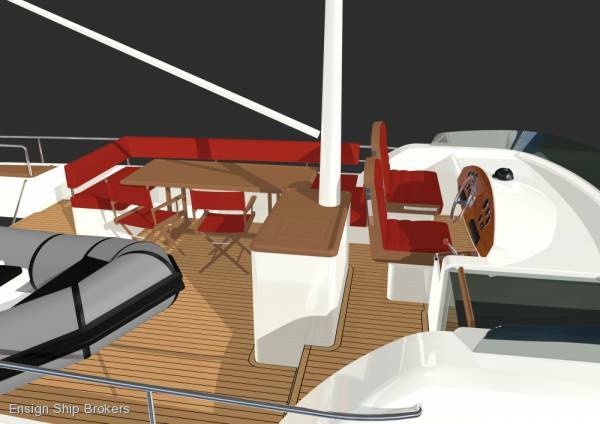 L shaped bench seat with table, chart table to port with drawer and storage space, reading spotlight, direct access to the flybridge. Storage, Cubby hole lockers, hanging locker, drawers, mirror, desk and seating, 2 opening portholes, 2 opening hatch, 220 volt socket, washroom with shower and seating. 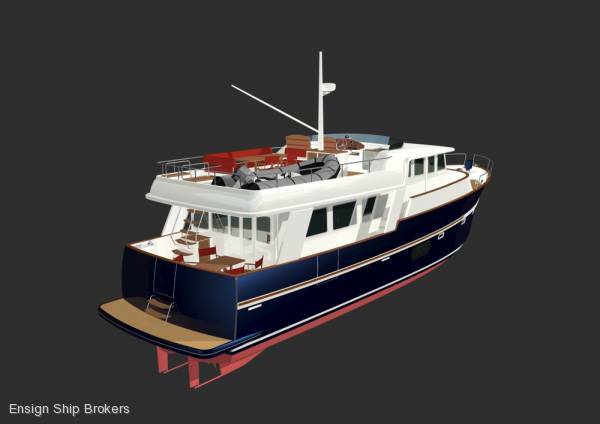 Teak deck - Teak bulwark, gangway doors for shore access, 2 stern door for access to the bridge and platform. 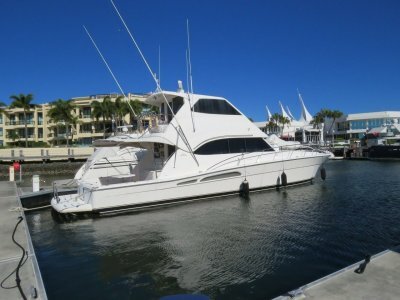 Flybridge - Sliding hatch for access, grey tinted windscreen in PPMA. Steering console with steering compass, steering wheel, electric engine controls, tiller angle indicator, fuel gauges, controls for bow and stern thruster, windlass, lighting, navigation lights and foghorn, adjustable pilot seat with armrests, 1 bench seat for 2 with storage, deck lounge with table and storage under seats, cloth cushions and backrest in PVC, worktop with sink and hot and cold water mixer tap under pressure, fridge, storage. Mast with fitted spotlights, supports aerials, radar and boom. Quarterdeck for storing dinghy or for use as terrace/sun deck. Companionway hatch for direct access to cockpit with stainless steel stairs and teak wood steps, space for life raft with stainless steel fixing bolt plates, flag pole bracket, stainless steel pulpit completely surrounding aft of flybridge. Front deck - Mooring, stainless steel pulpit, access to foredeck through door in Portuguese bridge. Anchor platform with stainless steel frame and teak wood boards, bow fitting with twin roller, electric windlass. 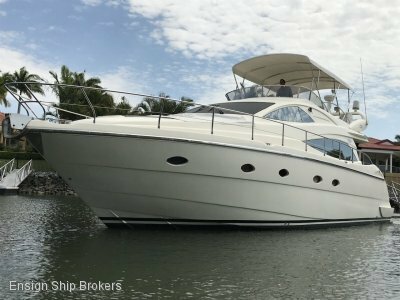 remote control in mooring locker + windlass control from wheelhouse and flying bridge steering stations, 2 mooring lockers, 2 stainless steel fairleads, 2 stainless steel mooring bollard on foredeck, 4 stainless steel mooring cleats (2 amidships - 2 aft). Cockpit - Self-bailing cockpit 2 alleyway doors to protect cockpit from wind and spray, folding slatted bench in wood, large cockpit locker with companionway ladder for access to storage room and engine room, outside ladder for access to flying bridge (teak wood steps and twin stainless steel handrail), access door to aft swim deck, teak wood decked swimming platform with stainless steel area guards and retractable ladder.